I took my family to the Amazon so they could learn to survive in the wild without the Internet. My 9-year-old son is a huge fan of computer games, but I know that as a small growing human he also needs nature, fresh air and exercise. It's my mission to get my family outside as much as possible and plug into nature. What better way to do that than by taking him on an adventure to the Amazon, which turned out to be an educational experience for all of us. 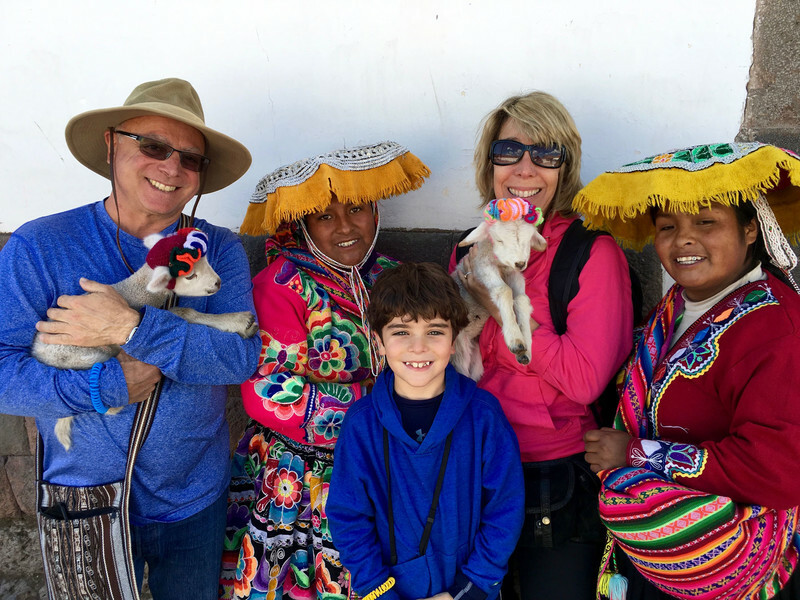 I booked our tour with International Expeditions because I knew that a trip to Machu Picchu, the Amazon and Peru's capital, Lima, would be easier with a guide. And Mom needs a vacation, too! We flew into Lima — a surprisingly family-friendly city well worth exploring. We stayed at the Swissotel in the heart of San Isidro and took full advantage of their indoor-outdoor pool, which was a great way to unwind after long-haul travel. The next morning our friendly guide, Percy, took us to the Kennedy Cat Park. The cats here aren't domestic but they're friendly, and for us animal lovers this was heaven. We spent our afternoon at the Chocolate Museum, where we joined a chocolate-making class — and then ate a lot of it. After dark we went to see the Magic Water Circuit of Lima, a light show with choreographed fountains. It's child-friendly fun and costs only $1.50 per person. We learned that Lima has a rich history as we toured its historic sites, including the Paseo de la Republica, the Basilica Cathedral and the convent of San Francisco de Asis. Its main cloister is decorated with 16th-century Sevillian tiles, and the underground crypts, the catacombs, hail back to colonial times. Lunch was at the Huaca Pucllana Restaurant, which sits on the site of the Pucllana pre-Inca ancient ruins in the city's wealthy Miraflores district. We also explored the city's colorful markets, which provided a perfect education for my son in how food is prepared in different countries. He now knows that not all chicken comes plucked in sealed plastic bags. After three restful nights we flew out of Lima and into Cusco in the Andes, the longest continental mountain range in the world. From the air we could see the lush rainforest canopy stretching for miles. Our next IE guide, Mario, had made the journey to Machu Picchu more than 300 times, so we knew we were in safe hands. Cusco is in the Urubamba Valley, and at an elevation of 12,000 feet it gave our lungs quite a workout. Our first stop was Chincheros, where we learned all kinds of Peruvian weaving techniques. Dressed in traditional outfits, the women were gracious and happy to welcome us. They even offered our son a cup of cocoa tea (a local specialty) when he ran out of breath running up a hill. We stayed that night at the glorious Aranwa Hotel and Wellness spa in the Sacred Valley, where we saw llamas and alpacas roaming outside our window. The next morning we caught a train from Ollantaytambo Station to the sacred site of Machu Picchu. My son loved this journey, which I found terrifying with hair-pin bends and steep curves. Fortunately we were equipped with lots of water, sunscreen and altitude pills, all of which we needed. Machu Picchu is almost 8,000 feet above sea level and another world. The ruins of the 15th-century Inca citadel stretch over five miles and have more than 3,000 stone steps that link to the different levels. My son was enthralled as it really was a computer game brought to life, while my husband was obsessed with how the Incas built it without modern technology. I just wished we'd factored in another day to see more. Our tour took us to the Inkaterra Hotel, an Andean village style complex set in the terraced hills. The next day we toured Cusco, a pretty town with bustling markets, vendors and ancient buildings. My son held a baby llama, and we watched the local children rehearsing a dance in full costume in the main square. It was a delightful stop before we headed to the Amazon River for our final rainforest adventure. We'd booked five nights on IE's boat, La Estrella, and had every need catered to. We enjoyed excursions to local villages, schools and markets as well as bird-watching, animal-spotting and star-gazing expeditions. The Amazon is the gargantuan 4,400-mile river that flows through Brazil, Colombia and Peru. I would not visit with my family here without a guide and all the required vaccines. I also made sure I'd brought everything on the IE checklist, including mosquito-repellent clothing and a $3.99 mosquito net head cover that my son wore. Part of this trip was educational. We had been asked to bring clothes and books for local children, and we loved being able to contribute to the Amazon community. We set out from Iquitos, a Peruvian port city that is constantly buzzing, thanks to the motorcycles and tuk-tuks (rickshaws with engines). We shared La Estrella with another family, which made for great bonding. Our cabin was cozy, and everything we ate was from the local markets and prepared by the boat's chef. Excursions were by skiff, a light rowing boat. It was a thrill to travel along the Amazon in such an intimate way. We went bird-watching and saw marsh birds, toucans, green ibis, macaws and caracaras. Packing a small pair of binoculars would have helped us see even more. Later on we visited a local village and donated school supplies. IE encourage this as part of their Adopt-A-School program. It was a useful lesson for my son to see how children his age live here. We also tried piranha fishing. I didn't catch any, but my son landed one and we ate grilled piranha for dinner. The next day we met basket-weavers and my husband and son learned how to use their blowguns. We also paid a visit to the Amazon Medical Clinic and the Amazon library, where we donated books. We spent our evenings on the deck of the boat watching the exquisite sunset and listening to the sounds of the rainforest. On our final day we did a stunning canopy walk through the trees and left the boat for the Ceiba Tops Lodge, which overlooked the Amazon. As nice as it was to be in a proper bedroom, we all missed the rocking of the boat and the animal noises that rang out across the river. For more information contact International Expeditions: www.ietravel.com. 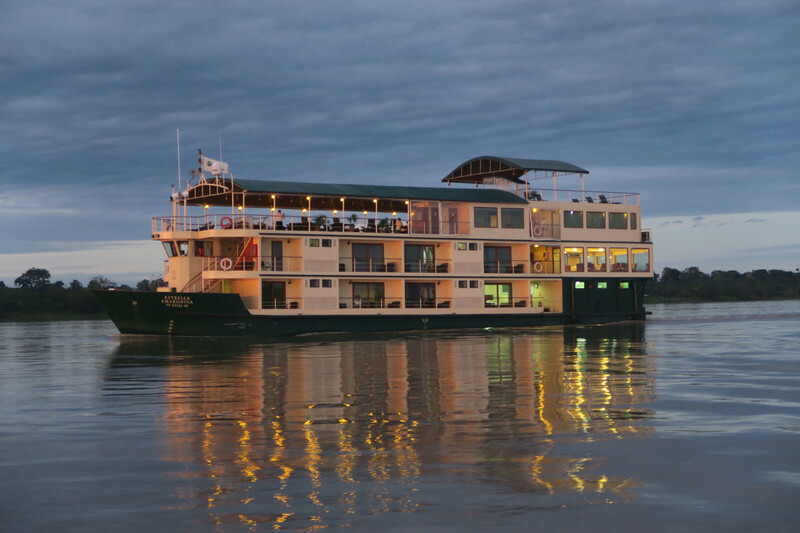 International Expeditions' riverboat, La Estrella, plies the waters of the Amazon River. Photo courtesy of Margot Black. 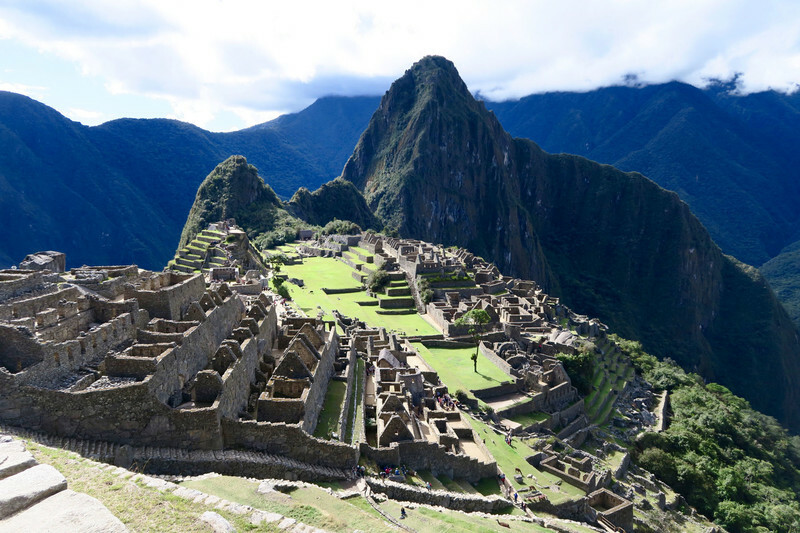 A visit to Peru must include a trip to the Andes and Machu Picchu. Photo courtesy of Margot Black. 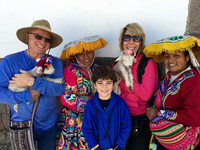 The author and her family meet some baby llamas and their caretakers during their South American adventure. Photo courtesy of Margot Black. 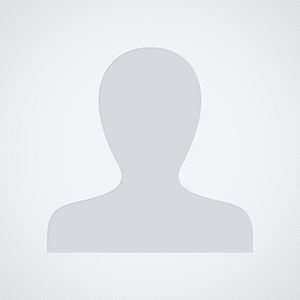 Margot Black is a freelance travel writer. To read features by other Creators Syndicate writers and cartoonists, visit the Creators Syndicate website at www.creators.com.